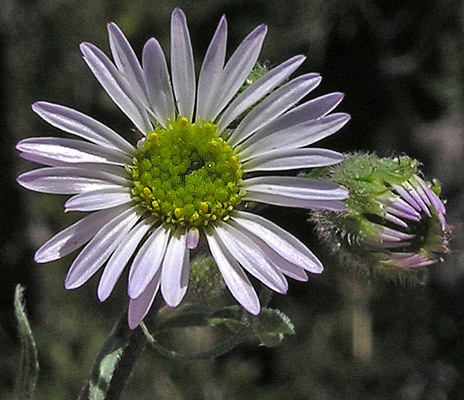 Click to read about the Erigeron genus. Colorado Trail near Orphan Butte, August 15, 2011. As summer progresses, Erigeron coulteri becomes more and more noticeable. 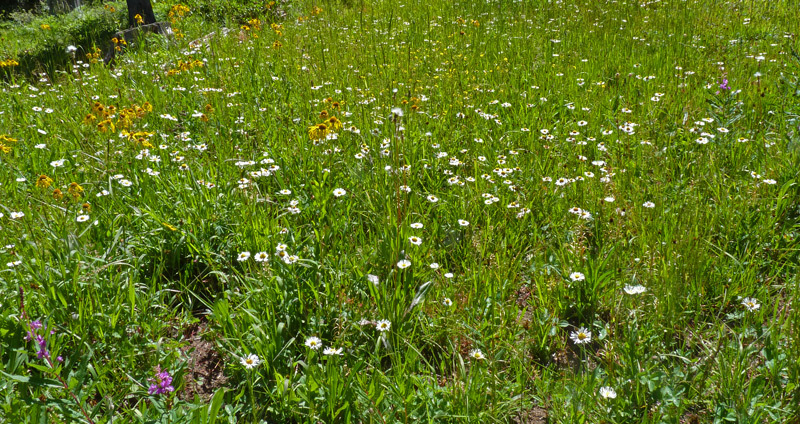 It grows to over a foot tall and often dots meadows with its intensely white flowers. Middle Calico Trail, August 9, 2004. 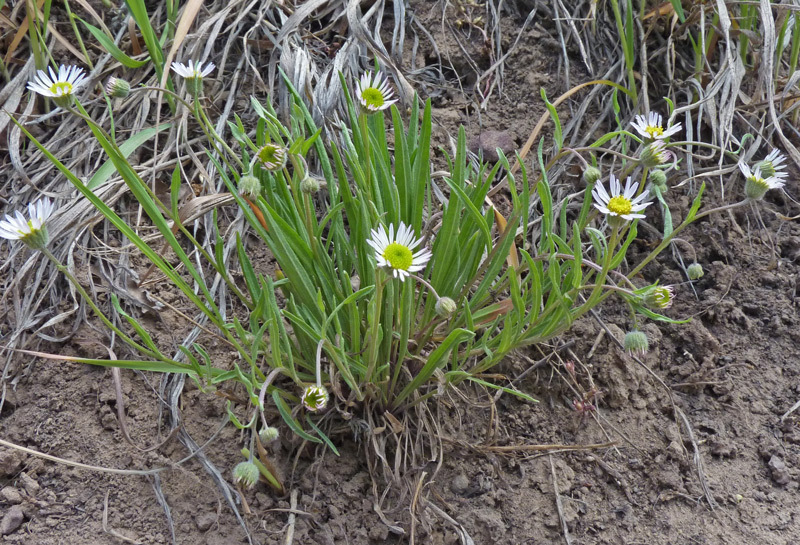 Coulter’s Daisy is common in high mountain dry and moist meadows and open Spruce woods. It grows singly, scattered in large patches in open woods, or more densely in sunny open meadows. Each plant generally bears one long-lasting flower. Basal leaves are often withered by flowering time. 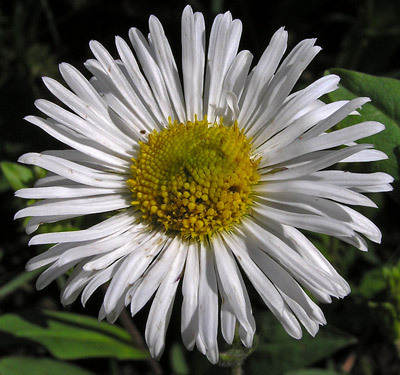 In late July, August, and into September, Erigeron coulteri is one of the most common white flowers in the mountains. 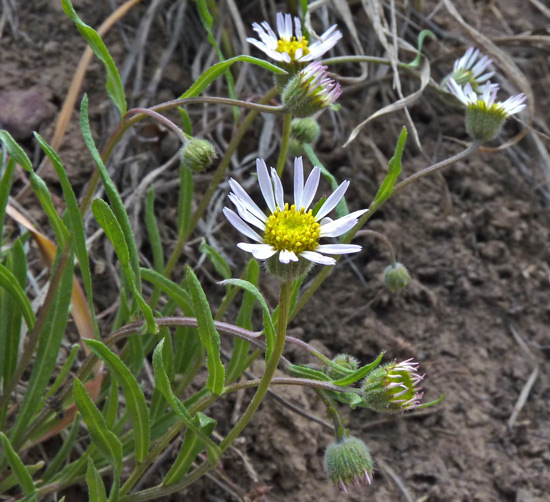 See the top photograph on this page for a common August mountain meadow. Colorado Trail above Roaring Fork, July 26, 2004. Calico Trail, August 25, 2014. As the top photograph at left shows, Erigerons can unfold in a rather cute and even humorous fashion. 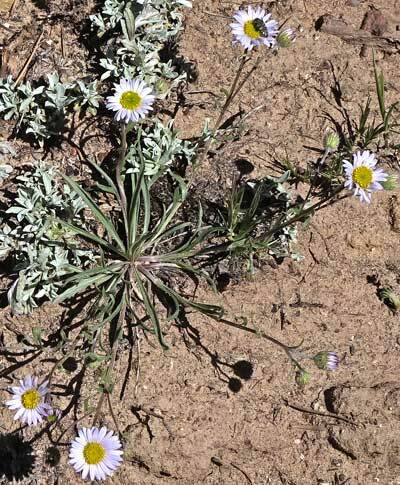 The bright white ray flowers of Erigeron coulteri contrast sharply with the many dark hairs of the phyllaries. 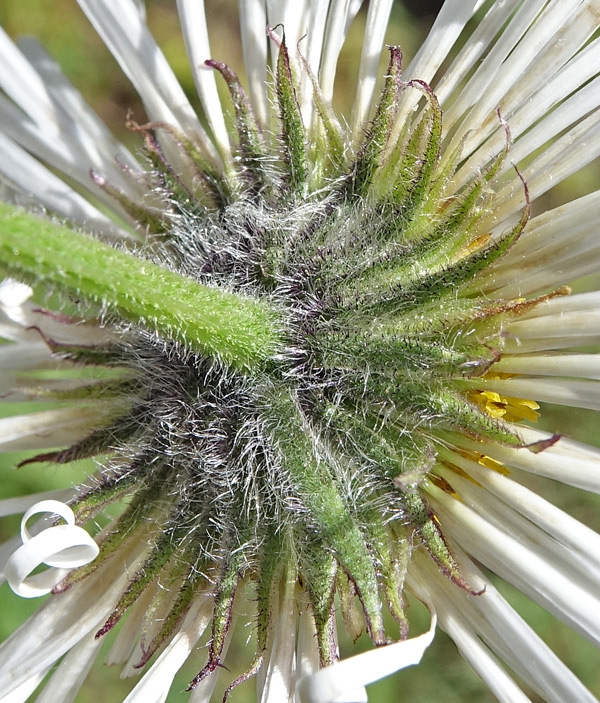 Compare these hairs (and other plant characteristics) with those of Erigeron elatior. Note the presence of both dark and light hairs on the phyllaries (and flower stem) of E. coulteri. 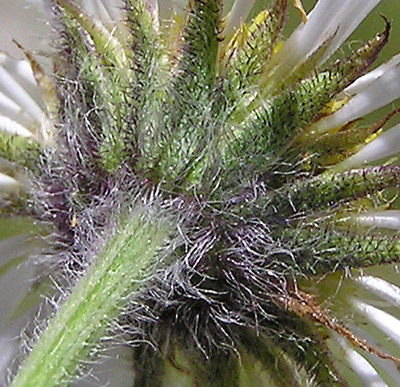 Most botanical keys indicate that these hairs have "black crosswalls" and that these black crosswalls are key in separating E. coulteri from other Erigeron species. But the crosswalls (which under high magnification appear as horizontal rings around the vertical hairs) are very difficult or impossible to observe in the field, even with a 10x hand lens. 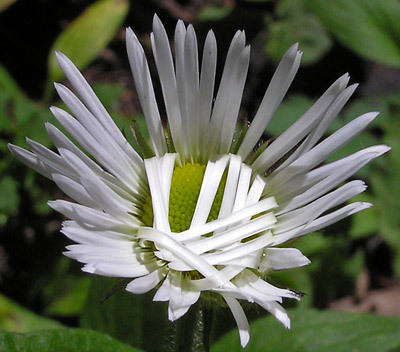 There really are much better and much more obvious distinguishing characteristics, e.g., the leaf shape or the intense whiteness of the ray flowers or the relatively upright and short nature of E. coulteri's hairs versus, for instance, the tangled masses of hairs on E. elatior (which E. coulteri is usually compared to in our area). At twenty-to-forty power magnification with a microscope, one can see that most phyllary hairs do, indeed, have crosswalls, but they are white as well as black. Using the higher magnification of a microscope, one can also see that some hairs are completely dark (maroon to black); some hairs are dark on the bottom and a gelatinous white on the top; some are completely white; etc. Of course one cannot see the black crosswalls on a black hair, unless, perhaps one is using a 100x lens. Since botanical keys give plant details that can be seen with the naked eye or a 10x hand lens, I was curious about who started the use of crosswalls which require far more than 10x to see. I spent quite a bit of time tracking down the first use of "black crosswalls" for E. coulteri. 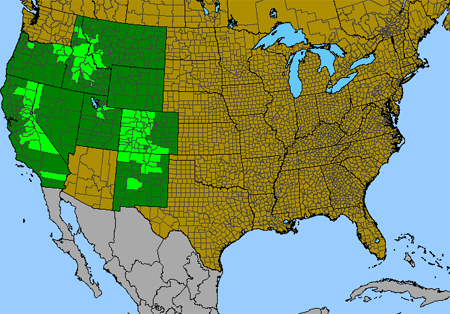 Interestingly, that reference is not in the original 1874 description of the plant by Porter and Coulter, nor is it in Rydberg's Flora of Colorado published in 1906. Neither of these expert floras mention black crosswalls. Sometime after these floras were published a flora used the "black crosswalls" characteristic as crucial in identifying E. coulteri. Apparently that flora was respected enough that many future floras used the black crosswalls characteristic in their keys. Foothills, montane. Meadows, Oak brush. Spring, summer. Mesa Verde National Park, May 29, 2013. 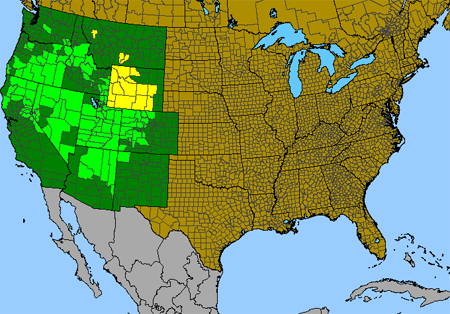 Northeast corner of Navajo Reservation, June 3, 2006; Mesa Verde National Park, May 29, 2013; and Robertson Pasture Trail, Abajo Mountains, Utah, May 31, 2016. 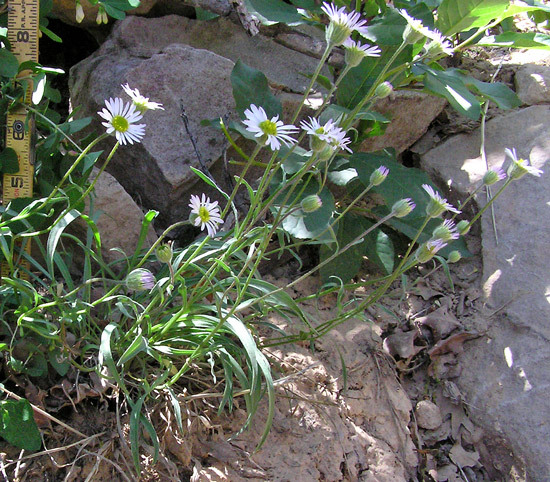 Erigeron eatonii's flowering stems arch outward and then upward from a central base. One, or more commonly, three-nerved, grass-like basal leaves also arch, but usually outward and then downward. Erigeron eatonii is most often found in sagebrush country but it is also occasionally found at higher elevations. Flowerheads are about a half-inch in diameter. Northeast corner of Navajo Reservation, June 3, 2006. Phyllaries, stems, and white-veined leaves are covered in sharp, mostly straight, and mostly appressed hairs (strigose hairs). Leaves most commonly have three nerves but, as in the above left photograph, they can have one nerve. The photograph at left shows an outer ring of central disk flowers open and yellow; the inner flowers are closed and green but will open over a few days. In the above left photograph the central flowerhead has more disk flowers open and yellow. Some of the yellow corollas and pollen may also be from the one-petaled outermost ring of ray flowers.